It was early April when we left our house and the garden was under several inches of snow. Down the valley, just a few miles away, there was no snow at all. It’s very upsetting to find out that you not only have worse weather than anyone else in your region, but that even within spitting distance others are enjoying an early spring that has yet to reach your door. After driving two hours west we arrived outside Ithaca on a beautiful spring day, at the garden of Hitch Lyman, snowdrop collector extraordinaire. 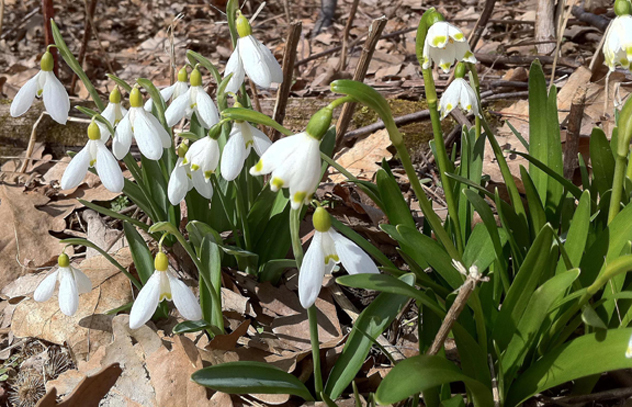 The Garden Conservancy’s Open Days Program was featuring Hitch’s garden that contains 400 varieties of snowdrops. A passionate Galanthus-snowdrop collector, Hitch has the largest snowdrop collection in the U.S., which is no small feat. He began Temple Nursery 20 years ago, which boasts five acres covered in a variety of plants including his extensive snowdrops collection and, needless to say, a classic Greek temple. Hitch also collects lilacs, Saunder’s hybrid peonies, species peonies, colchicums, Anemone nemerosas, Ranunculas fiscaria, horse chestnuts and fritillary species, and unusual perennials. When Hitch got his Greek Revival farmhouse it was sitting on a flat piece of land. 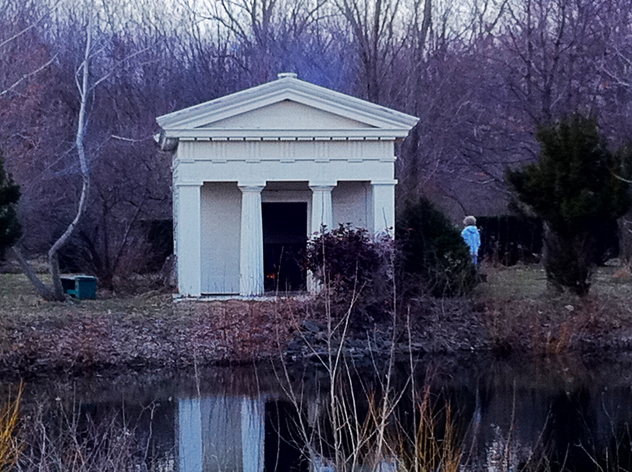 He built a pond and after finding four Doric columns in a salvage yard, he proceeded to make a temple. 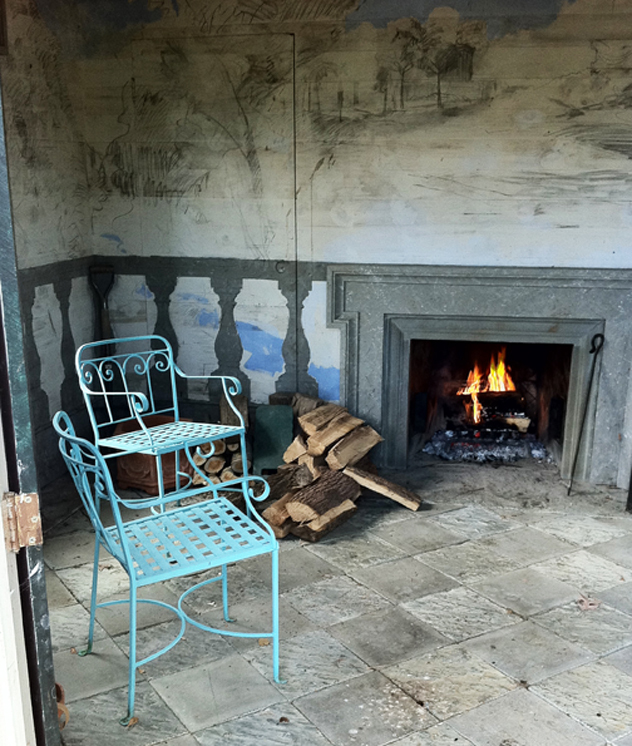 A true Classicist, Hitch needed a temple and, in this climate, one with a roaring fire in it to sit next to while taking a break from gardening. On the temple’s interior walls surrounding the fireplace Hitch had sketched murals of landscape scenes in charcoal. Outside at the back of the temple and concealed behind two large wooden doors we were shown a small room stuffed to the ceiling with garden tools. Hitch quickly closed the door for fear of a garden missile falling on one of us! Beyond the temple we walked into a garden surrounded by mature yew hedges, tall lilacs, fruit trees and many other plants still dormant. Barely out of winter nothing was showing any signs of life except for the snowdrops and snowflakes (Leucojum vernum). At first glance snowflakes- look similar to snowdrops but are, in fact, a different genus. Hitch began his horticultural journey at Cornell in landscape architecture, part of the Horticulture Department, and then switched to fine arts in the college of architecture. After completing his studies he moved to New York City. He had been helping on the side to make gardens, and when the gallery that showed his work closed this became his primary way of earning his living. He had gardened as a boy and along the way picked up plant knowledge working in nurseries. He became specifically interested in snowdrops when in 1975 he read My Garden in Spring by E.A. Bowles. On a visit to London in 1988 and at one of the monthly Royal Horticulture Society shows he saw Foxgrove Plants’ snowdrops display. Behind the booth was Audrey Vockins who would later become his friend and snowdrop mentor. Hitch admitted to her that he thought all the snowdrops looked alike. She showed him the intricate patterns on each of the groups of snowdrops on display and from that time on he was hooked. In his 2011 catalogue, Hitch offered 31 varieties of snowdrops and he aims to increase that number. He has sold about 120 types to American gardens. He sends out his catalogue in January and is sold out by March. He digs the orders in April, washes the plants clean, and sends them in flower or just after by fast mail. When replanted immediately and watered in, they seem to do well. I ordered several and planted them under an avenue of birch trees in a new woodland walk area of my garden. I was very impressed with the plants I received. Each plant was wrapped in bubble wrap for protection, and the roots were still moist when they arrived. I went online and ordered the book Snowdrops by Matt Bishop, which showed me how limited my previous snowdrop purchases had been. Most bulb catalogs cannot offer the interesting selection being grown by Hitch, and in my experience the bulbs do not always do very well. Planting “in the green” is the way most Galanthus collectors sell their plants. The prices range from $5 to $75. It might seem a little expensive but in no time the plant will clump up and can be divided for years to come. The generic name Galanthus, from the Greek gala (milk) and anthos (flower), was given to the genus by Carl Linnaeus. He described Galanthus nivalis in his Species Plantarum published in 1753, which is the most common and widespread snowdrop in Europe. 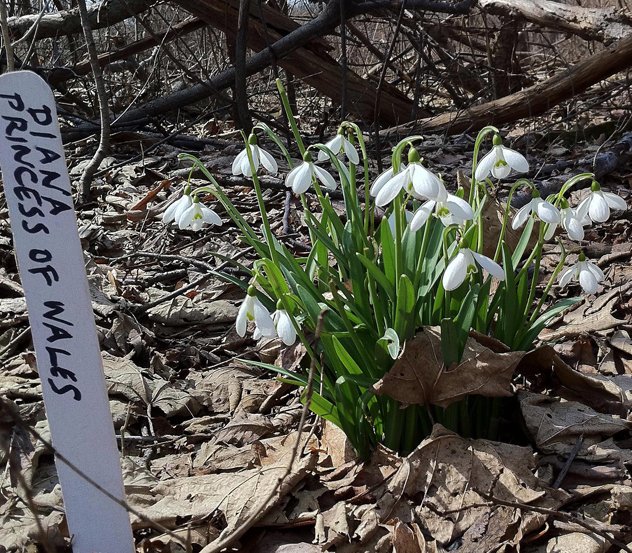 The epithet nivalis means “of the snow,” referring either to the snow-like flower or the plant’s early flowering.Britain has many Galanthus collectors. 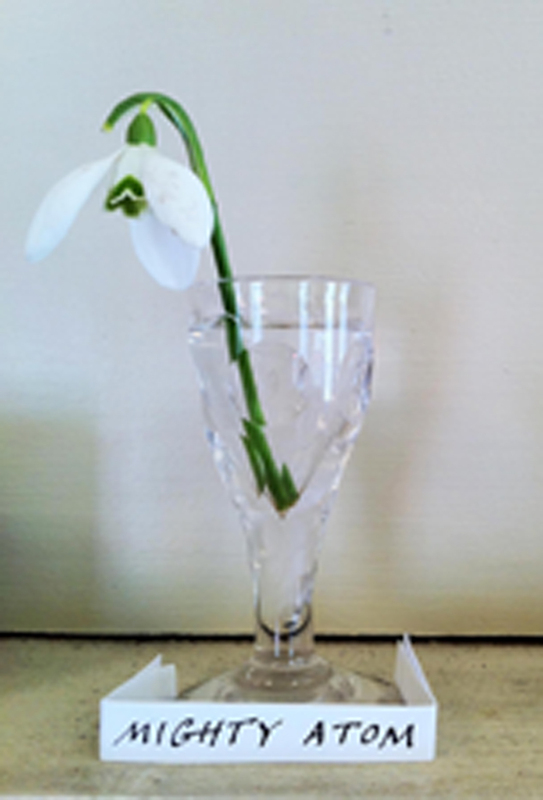 It is believed G. nivalis, the first snowdrop to arrive to Britain, was introduced by the Romans. In the Middle Ages white flowers were associated with purity, and more snowdrops were brought to Britain where they were planted in places of pilgrimage in honor of the Virgin Mary. In the 1880’s G. elwesii was discovered in Turkey and later imported in large numbers. The Victorians considered snowdrops a symbol of purity and created Snowdrop Leagues for young ladies. They were often planted on graves because of their ability to thrive. Nowadays churchyards are a prime place for galanthophiles searching out new varieties. Their popularity seems to be growing which was made clear to me when I met some of the people who had driven from as far away as Potsdam, NY (near the Canadian border), to see Hitch’s collection. Another man who had driven some three and a half hours had clearly got the collecting bug. He knew a great many of the names of the snowdrops we were looking at and had come back to the garden to see more. Hitch ships snowdrops to a wide area of the northern U.S. He said they fail south of North Carolina, flourish in the Pacific Northwest, New England, Philadelphia and Baltimore areas, and upstate New York. They want a cold winter and a cool summer. I love plants that flourish in our arctic conditions and for once I can feel a little smug about having plants that southerners and people in warmer climates can’t have. When thinking of a planting site, good drainage and good light are top priorities. Snowdrops will not survive in stagnant wet soil. Planting them below evergreens will be a bonus because the plants will stand out against the dark green background. 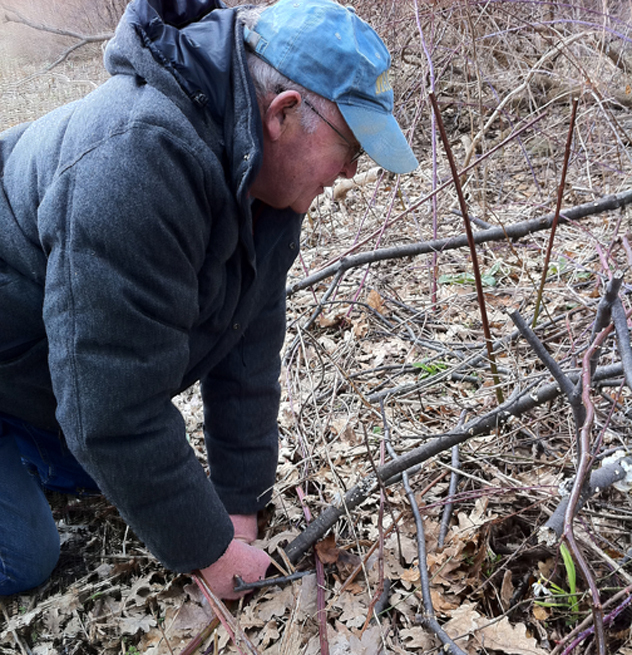 It’s fine to plant under deciduous trees because when the plants come into flower the trees have yet to leaf out, and they will get the sunlight they need to thrive. Steep banks are a good place to plant, because of the good drainage a bank offers. Do not use wood or bark chip mulches as they can lead to a depletion of the soil. Bone meal is a good slow release fertilizer to use when the plant is dormant. To order a catalogue send $3.00 to Hitch Lyman, Temple Nursery, P.O. Box 591, Trumansburg, NY 14886.